The exclusive Dressage Top 10 is coming to Sweden and Sweden International Horse Show. And brings at the same time a new and exciting format to the dressage sport. – “This is what I have wished for my sport for many, many years”, says the world ranking list number one Isabell Werth (GER). The world’s very best dressage combinations will compete for close to 200 000 euros in the Saab Top 10 Dressage. Sweden International Horse Show launches the tickets and presents the year’s big new competition, Saab Top 10 Dressage. The Top 10 is an existing concept in Jumping and now the same exclusive competition format has been created for the world’s best Dressage combinations. 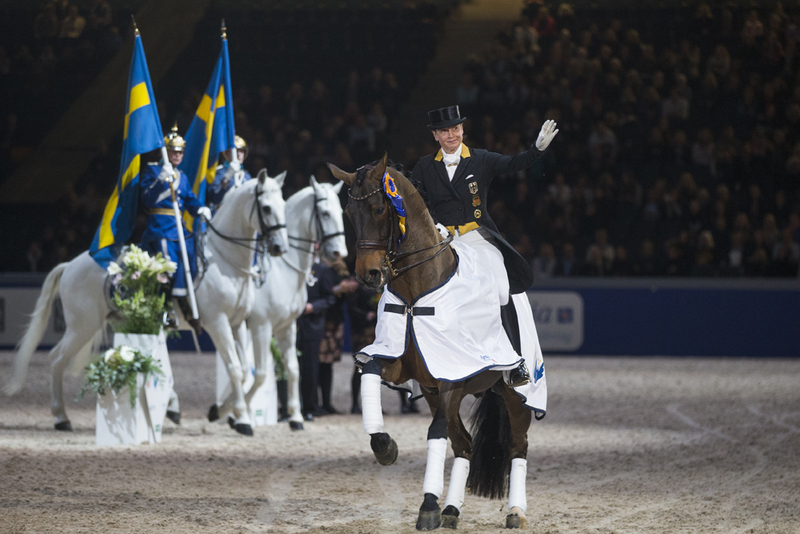 Sweden and Sweden International Horse Show in the Friends Arena in Stockholm will host the very first Saab Top 10 Dressage event at the beginning of December. – “We are enormously proud that we in Sweden have secured an annual world class competition and that we could deliver this for international top Dressage. After many years of hard work this has now become reality thanks to the generous support of Saab, and the prize money will be substantially increased for the second year. But we also have to praise Patrik Kittel. His dedication to his sport is inspirational”, says the Chair of Sweden International Horse Show, Ulf Rosengren. And the world elite dressage athletes look forward to meeting in Stockholm. – “This is what I have wished for in my sport for many years. Sweden International Horse Show is a fantastic competition venue which can deliver an absolute world class competition”, says the world number one Isabell Werth. – “Dressage has been behind Jumping in terms of development and the fact that we’ll now have the chance to compete in such a prestigious event with big prize money is important for the riders, horse owners and the sport itself. This format also takes Dressage into the future with short top quality starting lists with great entertainment value”, says the top ranked Swedish rider Patrik Kittel, who is one of the brains behind the Saab Top 10 Dressage. – “It is also a fantastic opportunity for Swedish equestrian sport as it will give two Swedish combinations the opportunity to start. We will also work with wild cards to guarantee that the current best riders take part”, says Patrik Kittel. The Swedish multinational defence and security company Saab is the title sponsor of the event, taking its dedication to equestrian sport outside national borders. – “Our dedication to equestrian sport includes developing the sport and increasing public interest. Saab is one of the world’s most innovative companies and it’s a natural fit for us to contribute with both new technology and new ideas. We do this within the “Innovations of Equestrian Sport” project and the Saab Top 10 Dressage fits in perfectly as a new and inspiring competition, and we are also aiming high internationally. It is especially pleasing for us as a Swedish international company to place Sweden on the map within the sport of Dressage”, says Stefan De Flon, sponsorship manager at Saab. Saab Top 10 Dressage takes place over two days (2-3 December) at the Sweden International Horse Show in Stockholm. Some of the top rider will also give personal comments and advices during the national dressage competition the 1 December. ← Föregående nyhet Tickets and new program out now!